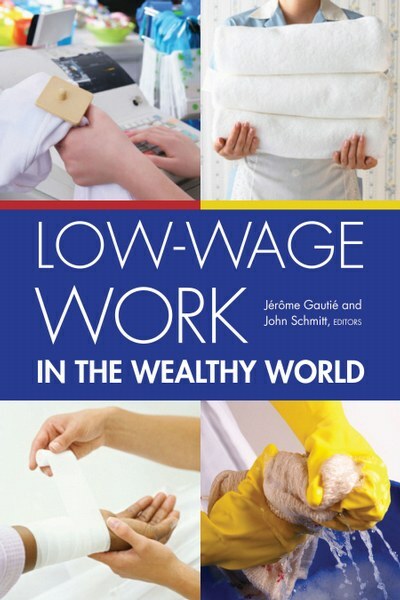 Today is the official release date for Low-Wage Work in the Wealthy World, the book I co-edited with French economist Jerome Gautie. The book summarizes the results of a multi-year study sponsored by the Russell Sage Foundation of low-wage work in Denmark, France, Germany, the Netherlands, and the United Kingdom, with links back to an earlier related project on Low-Wage America. The first section of the book provides a cross-cutting overview of labor-market institutions in each of the five countries. The second section reviews the findings of case studies of low-wage occupations in five industries --hotels, hospitals, call centers, food processing, and retail. The full list of contributors: Eileen Appelbaum, Rosemary Batt, Peter Berg, Annette Bernhardt, Gerhard Bosch, Fracoise Carre, Laura Dresser, Jacob Eskilden, Damian Grimshaw, Klaus G. Grunert, Karen Jaehrling, Susan James, Caroline Lloyd, Geoff Mason, Ken Mayhew, Philippe Mehaut, Philip Moss, Wiemer Salverda, Chris Tilly, Marc van der Meer, Maarten Van Klaveren, Achim Vanselow, Dorothea Voss-Dahm, Chris Warhurst, Claudia Weinkopf, and Niels Westergaard-Nielsen. UPDATE 05/08/2010: Business Week Economics Editor Peter Coy cites the book and quotes contributor Eileen Appelbaum and me in a story on immigration reform.